Our research aims to improve health outcomes. Clinical translation converts basic research discoveries into better ways to prevent, diagnose and treat disease. We are facilitating linkages between clinicians and laboratory researchers, and supporting clinical research. We are committed to harnessing the talent of our researchers to deliver real healthcare improvements. Our Clinical Translation Centre fosters linkages between our laboratory researchers and clinicians. Supporting the involvement of clinician-scientists in our research programs. Enabling our researchers’ involvement in the development, delivery and evaluation of clinical trials. 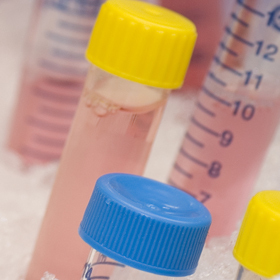 Facilitating the collection and analysis of human samples for approved research. More than 100 current clinical trials are based on discoveries made at the Institute. Clinical translation is research that leads to better understanding of disease, and/or development of new diagnostic tests or treatments. Measuring the impact of a new strategy to prevent, treat or diagnose a disease in humans, using a clinical trial. Analysing human samples, such as those taken from people with a certain disease. Matching the genetic information (genome sequence) of a patient with features of their disease. How do laboratory discoveries reach the clinic? Many discoveries that have benefited the health of the community arose from basic laboratory research. Understanding how molecules, cells and tissues normally function gives insights into what goes wrong in disease. Discovering how a disease develops can lead to new ways to prevent, treat and diagnose that disease. These are collectively called ‘interventions’. Preclinical studies are used to test a proposed intervention in the laboratory, using patient samples or models that are similar to the diseased cells. Phase I: Tests the safety of the intervention in a small number of people, and whether the intervention works as intended. Phase II: Determines how well the intervention can work. Phase III: Uses a larger group of people to measure the overall benefits of the new intervention, comparing it with no intervention, or other existing interventions. If an intervention shows success through all the stages of a clinical trial, it may then need government approval before it is available to the public. In Australia, the Therapeutic Goods Administration assesses the outcomes of clinical trials to approve new treatments, diagnostic tests or other interventions. The intervention to be effective and improve health outcomes. Funding for the significant costs of conducting clinical trials. This is why many clinical trials are conducted with investment from pharmaceutical companies. Willing to participate and able to attend a study or trial location. Fully informed about what their participation involves including any foreseeable risks. Aware of their rights to withdraw from the study. Eligible to participate in the study by meeting specified criteria, such as clinical diagnosis, medical history, or age. Australian New Zealand Clinical Trials Registry. ClinicalTrials.gov, maintained by the US National Institutes of Health. By joining the Volunteer Blood Donor Registry you can contribute to medical research aimed at preventing, treating and curing disease. All research at the Walter and Eliza Hall Institute that involves people is overseen by our Human Research Ethics Committee. The committee’s operation is approved by the National Health and Medical Research Council (NHMRC), and conforms to the NHMRC National Statement on Ethical Conduct in Research Involving Humans (2007). Provides advice on translational and clinical research. Assists with the operation of the Clinical Translation Centre. Contributes to the recruitment and support of medically qualified researchers at the Institute. Cared for a family member or friend with the disease. Improve the communication of results to the community. Ensure research addresses questions that are important for consumers. Educate researchers to understand their disease fully from a consumer point of view. Our Consumer Advisory Panel has been established to better connect our research with community experiences of disease and consumer expectations.